If I am to keep to my weekend motto, then this blog post must be “simple”. The above quote has been sitting on our table for many years and was our inspiration for the weekend. Preparing for Africa has not only inspired mental clearing, but physical clearing as well. This weekend the kids and I did mega house and garage de-cluttering. I have created the space needed to immerse myself in Africa. Now I feel free to dive into our reading list! I am a non-fiction junkie, so plan to start with Emerging Africa: How 17 Countries Are Leading the Way – Steven Radelet. Steven Radelet was one of the many incredible speakers at this year’s ONE Power Summit. Being an economist, he gives an educated analysis of the progress being made in many African countries and provides a model that can be followed for the entire developing world to follow for progress. His book was a favorite of one of my fellow ONE CDLs so I am excited to dive in. As the kids and I were working we talked lots about my upcoming trip and what I may see. I believe what they visualize may have put into perspective really how little we need; being with one another, appreciating our surroundings, and the health that we are blessed with. After we completed all of our spaces, we set down together, looked around—and smiled! To all of the ONE dads–buckets of gratitude! I will not deny that being female and being a mom gives me super powers. I did deliver a 10 pound baby boy at home! But with all that we do as moms, there still remains a space to fill by all of the dads. Just imagine the possibilities if the ONE moms worked beside the ONE dads raising ONE families! I just happen to be surrounded by many ONE dads whose compassion resonates in their voices to make poverty history. Moms are expected to take action when we see children dying from preventable diseases. We sometimes fail to see that dads are often just as moved to join the conversation. Truth be told—I would not be a ONE mom if it were not for my husband. He and I grew up together, so he has always known my thoughts of the world. Whenever he read a news piece of interest he would always share it with me. This is how I learned about Live Aid, DATA, Drop the Debt, and ONE. It was September 2005 in Chicago, my birthday and first U2 concert when he pulled me from my crowded place in the merchandise line to meet this ONE volunteer. He said, “This is that organization you were reading about. You need to sign up.” Well I listened, became a member, and have wore the same ONE band ever since. So yes, from this experience a ONE mom was born, but also an incredible ONE dad. To my husband for supporting me every step of the way on this journey and encouraging me to magnify my voice while adding his to the conversation and to every ONE dad I have met along the way I give buckets of gratitude. The world is lucky to have all of you! By the way, was it not a ONE dad who started this entire movement? My last three weeks have been filled with spring concerts, talent shows, socials, graduations, award ceremonies, celebrations, grocery shopping, bill paying, house cleaning (minimally), laundry, and ONE events. I compare the end of the school year to running a marathon, without the fitness benefits. I find though, that everyone I talk to (parents or not) is busy. I like to say “the world is busy” when I find myself complaining about the demanding schedule of life. This comment reminds me to remain conscious of my life as it is here where I have a car, roads, and grocery stores. 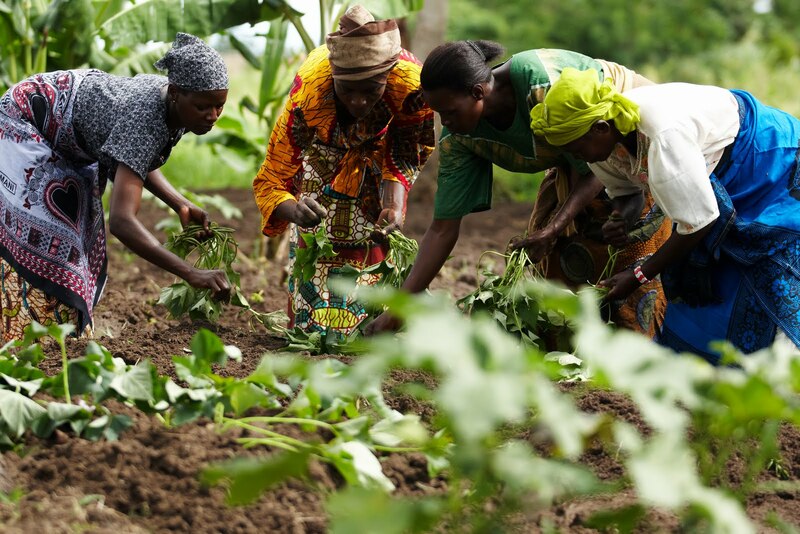 Did you know that the women of Kenya produce 80% of the food and represent 70% of all the agriculture workers? They do this while caring for their families and communities at large. This puts my life in perspective and makes preparing dinner seem minuscule. I am in awe of the resilience of African women. The strength and courage I have always imagined these women to have will be realized when I witness their experience next month. On my trip to Kenya with the ONE Moms Advisory Council we will be meeting with women to hear their stories of hope and optimism as well as the challenges they face in their day to day lives. We will have seven days to meet a variety of women from different areas of the country. I will get to find our connections and hopefully help others feel connected as well. I want to honor them with this blog and my words. This trip has presented itself at a transitional time in my life. There is a reason it is happening now in this moment. I do not wish to ponder why and create expectations. My plan is to slow down, find my center, and be present in each and every moment. I have had fears in my life for sure; mice, spiders, swimming in the ocean, and writing for this blog. So the question remains how to face them. Living deep in the Indiana woods there was no escaping mice and spiders. Reluctantly, I learned how to coexist. Now, living in coastal North Carolina I am learning to be in the ocean without my knees knocking. Just yesterday I caught my first wave on a surf board. So here I sit today ready to conquer this blog post! Honestly, it is not the blog I am afraid of or how people will respond to it. It is that feeling of something greater than me is happening through my words. Leaving Indiana and my position as a telephone triage nurse left me with space to rediscover my passions. For me, being home with kids has been the most rewarding experience of my life, but at times has left me feeling personally lost and inadequate. Deep down, though, I feel I am bound to do great things outside of being a mom. I believe we are ALL here to do great things with our time on the earth. We just have to figure out where and turn ourselves in that direction. I had a conversation with my husband last summer about my plans after the kids went back to school. I mentioned that I had no desire to return to nursing and that I wanted to actively research what opportunities existed with the organizations and companies I had been supporting through the years. On my list was The Body Shop, Ten Thousand Villages, Product(Red), Oxfam, The Full Belly Project, and ONE. I was not exactly sure what I was looking for, but knew this is what I needed to do. For those who believe in the “law of attraction” they will understand then how it came to be that just two weeks later there was a ONE documentary screening right here in Wilmington! Of course I was there and later that evening received an email asking if I would be interested in volunteering as a ONE Congressional District Leader. For many reasons saying “yes” was frightening, then I went to the quote by Marianne Williamson and continued reading…”We ask ourselves, who am I to be brilliant, gorgeous, talented and fabulous. Actually, who are you not be. You are a child of God. Your playing small does not serve the world. We were born to manifest the glory of God that is within us. It’s not just in some of us, it’s in everyone. As we let our own light shine, we unconsciously give other people permission to do the same. As we are liberated from our own fear, our presence automatically liberates others”. So here I am visiting Washington D.C., meeting Members of Congress, volunteering at U2 concerts, and traveling to Kenya. This is where I am meant to be and this is only the beginning of where I am going. What is there to be afraid of?